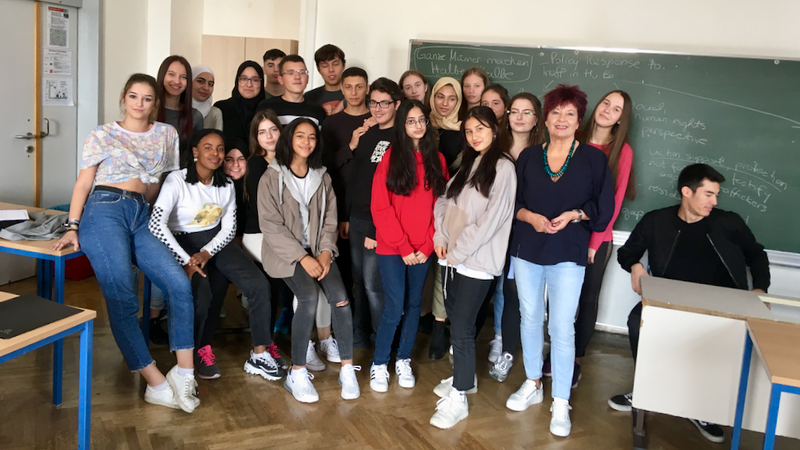 Dr. Helga Konrad visited the BRGORG15 European High School on the 8th of October 2018; she was invited by the class 6.E to talk about human trafficking in Austria, her work as Minister, the campaign ’Ganze Männer machen Halbe-Halbe’ and the historical significance of the passing of the ’Protection Against Violence Act’. She talked about how traffickers use force, fraud or coercion to lure their victims and force them into labour or commercial sexual exploitation. She also mentioned her work as a Minister for Women’s Affairs and her campaign with the slogan ’Ganze Männer machen Halbe-Halbe’, which didn’t really succeed at the time. Dr. Konrad studied Romance studies and English studies in Styria. She’s a former Austrian Federal Government Minister and Parliamentarian. She hosted the very first EU Conference on ’Trafficking in Women fort he Purpose of Sexual Exploitation’ in Vienna in 1996 and was Head of the Austrian government delegation fort he 4th UN World Conference on Women in Beijing/China. She is currently active as an independent consultant on combating Trafficking in Human Beings.